School is back in session - Pay attention while driving. Keep your head up and the phone down! With summer over and school back in session drivers should be extra cautious, especially in school zones and where kids are getting on or off the bus. 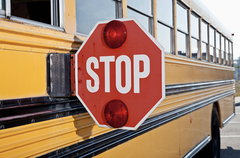 Parents, whether your student is walking to school or riding the bus remind them to be safe. Below are a few tips for drivers, parents, and students.